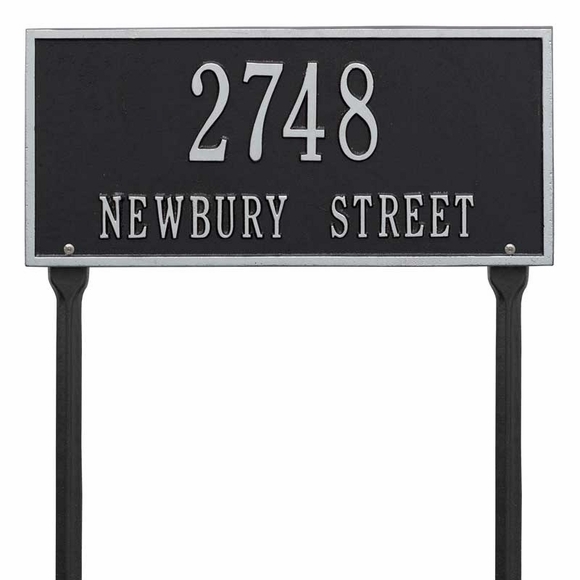 Rectangle Shape Lawn Mount Address Plaque - - 16" x 7.25" residential address plaque holds one or two address lines. Lawn mount. Made in USA. Colors (from left to right in small images): BG black with gold characters; BS black with silver characters; BW black with white characters; OG bronze with gold characters; PS pewter with silver characters; and WH white with black characters. To see all the colors, click top link in Related Products. Includes mounting hardware and lawn stakes. Rectangle Shape Address holds one or two address lines. Lawn mount.